Effective Communication 13 Effective Communication 3 potential problems to the attention of building staff and management, and foster a sense of shared responsibility for maintaining a safe and comfortable indoor environment. The group will be most successful if it represents the diverse interests in the building, including: ■ building owner ■ building manager ■ facility personnel ■ health and safety officials ■ tenants and/or other occupants who are not facility staff ■ union representatives (or other worker representatives) Clarify Responsibilities It is important to define the responsibilities of building management, staff, and occupants in relation to indoor air quality. These responsibilities can be formalized by incorporating them into documents such as employee manuals or lease agreements. This section discusses establishing and maintaining a communication system that can help prevent indoor air quality problems and resolve problems coopera- tively if they do arise. If you are currently responding to an indoor air quality complaint, you may want to skip ahead to the discussion of Communicating to Resolve IAQ Problems on page 15. 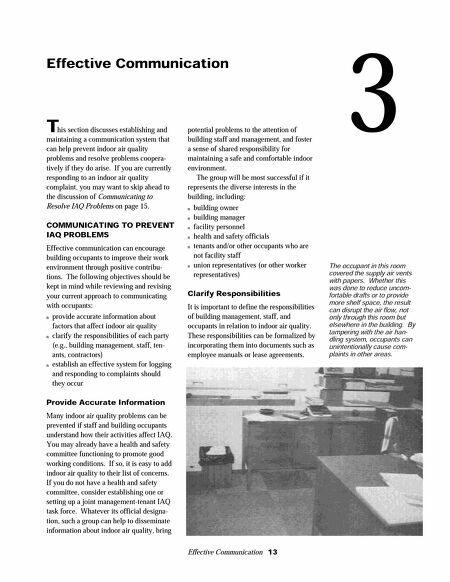 COMMUNICATING TO PREVENT IAQ PROBLEMS Effective communication can encourage building occupants to improve their work environment through positive contribu- tions. The following objectives should be kept in mind while reviewing and revising your current approach to communicating with occupants: ■ provide accurate information about factors that affect indoor air quality ■ clarify the responsibilities of each party (e.g., building management, staff, ten- ants, contractors) ■ establish an effective system for logging and responding to complaints should they occur Provide Accurate Information Many indoor air quality problems can be prevented if staff and building occupants understand how their activities affect IAQ. You may already have a health and safety committee functioning to promote good working conditions. If so, it is easy to add indoor air quality to their list of concerns. 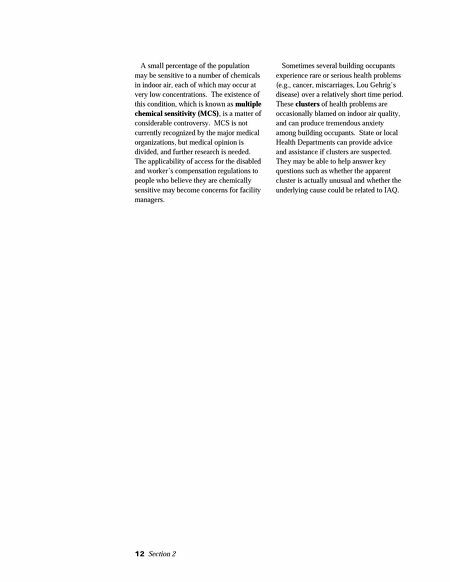 If you do not have a health and safety committee, consider establishing one or setting up a joint management-tenant IAQ task force. Whatever its official designa- tion, such a group can help to disseminate information about indoor air quality, bring The occupant in this room covered the supply air vents with papers. Whether this was done to reduce uncom- fortable drafts or to provide more shelf space, the result can disrupt the air flow, not only through this room but elsewhere in the building. By tampering with the air han- dling system, occupants can unintentionally cause com- plaints in other areas.